GoTriangle can help you get to Durham from the airport. The easiest way to plan the trip is using Google Maps, bus fare information can be found here and you may download Transloc’s Rider app to track your bus. Amtrak has a train station in downtown Durham within blocks of the convention center. For those driving to the event, Durham is conveniently located near both I-85 and I-40. Parking is available at all hotels. 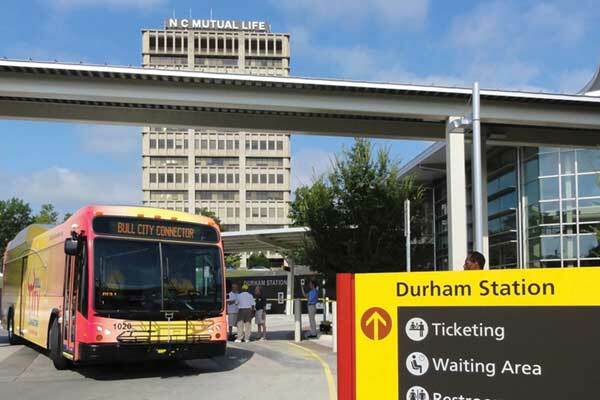 In addition to being a very walkable and bikeable city, Durham’s local transit system can get you anywhere you need to go. Parking is available across from the Durham Convention Center at the Durham Centre Deck located at 300 Morgan Street. For more parking options, visit here. If there is no more room at these hotels but you still need to find lodging, Discover Durham lists many options. Interested in sharing a room? Please use this Google sheet to connect with other Summit attendees looking for a roommate for the event. North Carolina state employees: Here are some potential lodging options if you need a hotel that offers the North Carolina state employee government rate.